Shares were mixed in Asia on Wednesday, trading in a narrow range after overnight gains following conciliatory comments on trade by Chinese President Xi Jinping. Xi’s pledge to cut tariffs on imported cars and improve intellectual property protection was seen as a step toward easing trade tensions. 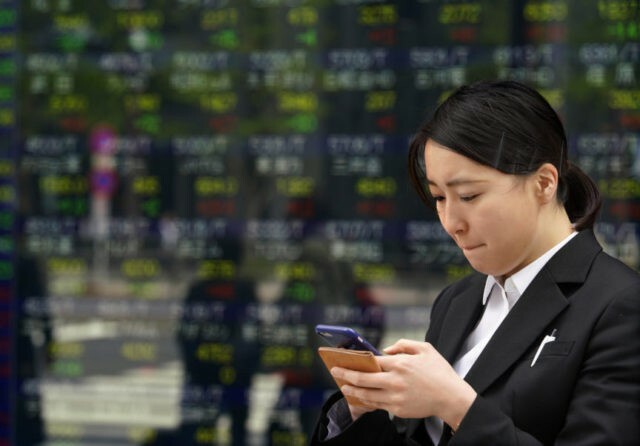 KEEPING SCORE: Japan’s Nikkei 225 stock index lost 0.2 percent to 21,750.92 and the Kospi in South Korea was flat at 2,450.82. Hong Kong’s Hang Seng jumped 0.8 percent to 30,960.72 and the Shanghai Composite index surged 0.9 percent to 3,219.07. Australia’s S&P ASX 200 dipped 0.3 percent to 5,340.70. Shares rose in Taiwan and in most Southeast Asian markets. WALL STREET: Facebook, Twitter and Snap rallied as senators questioned Mark Zuckerberg about the Cambridge Analytica privacy scandal that has engulfed the company over the last four weeks. Technology companies have stumbled as investors wondered if the government will implement tighter regulations on technology companies, and those worries eased Tuesday. Zuckerberg will testify before the House of Representatives later Wednesday. The S&P 500 index surged 1.7 percent to 2,656.87. The Dow gained 1.8 percent to 24,408. The Nasdaq composite added 2.1 percent to 7,094.30 and the Russell 2000 index of smaller-company stocks advanced 1.9 percent, to 1,543.43. CHINA FACTOR: General Motors, which has major manufacturing operations in China, rose 3.3 percent after Chinese President Xi Jinping promised changes in some areas that the U.S. has identified as priorities. He didn’t address other thorny topics including requirements for foreign companies to give technology to potential local competitors. So far the U.S. has proposed tariffs on $50 billion worth of products made in China, and China has said it could put tariffs on an equivalent amount of goods imported from the U.S. Also, President Donald Trump has directed his trade representative to look into targeting another $100 billion in Chinese goods. ENERGY: Benchmark U.S. crude shed 16 cents to $65.35 per barrel in electronic trading on the New York Mercantile Exchange. It rose 3.3 percent to $65.51 a barrel on Tuesday. Brent crude, used to price international oils, lost 23 cents to $70.76 per barrel. It had added 3.5 percent to $71.04 a barrel in London. Oil prices have yoyo’d recently as investors wonder if the trade dispute will hamper global economic growth. CURRENCIES: The dollar slipped to 107.06 yen from 107.20. The euro rose to $1.2365 from $1.2357.